September 29, 2007, the morning following a snow storm, I made my way around a bend in the dirt logging road on which I was hunting. My wife and 8-year-old son were with me, helping me to look for deer. My wife had just spotted a doe with a couple of fawns. We watched them for awhile, hoping a buck would join them in the clear cut. After several minutes it became obvious that they were alone so we continued on. I saw a stump ahead that had good vision of that clear cut and one that I knew was around the bend so we made our way toward it. Just as we rounded the bend, all I saw were antlers running across the road. At first, all I could do was yell “Oh Crap!” The enormous Blacktail was running full speed with a doe, they had been spooked by a vehicle on the other side of the hill. As I raised my 30.06, the doe stopped running and looked at me. 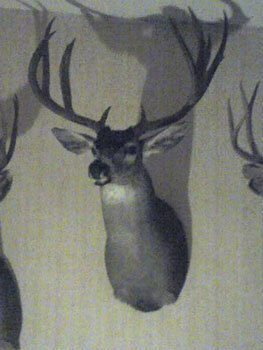 I was ready to pull the trigger on the buck, not expecting him to stop. But then, by some miracle, he did; two more leaps and he would have been over the edge of the clear cut and gone. He stopped running and looked right at me. He stood broad side at about 60 yards. The Barnes Triple Shock, 180 grain bullet entered just behind his right front shoulder, blew out his lungs and exited out the other side. The buck hesitated for a second, looked like he was going to run, but then dropped to the ground. Bone fragments injured his spine and liver, but his heart was untouched. I knew he was big, but I was shocked as I approached the buck. The thing was huge. 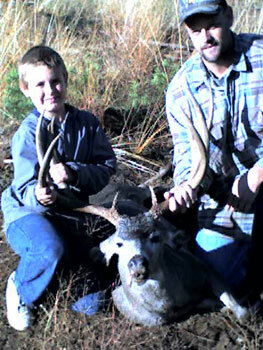 His body was the largest I had seen for a Blacktail, he field dressed at well over two hundred pounds. Hes tall and wide. His height measures 23 inches and his outside spread measures 28 inches. Hes thick, too, with a lot of mass. Three of his tines are webbed. He is a 4 X 3 with eye guards that measure 3 inches. He has a kicker sticking out his left side. All-in-all, he has 10 scorable points. Ill have him officially scored after the required waiting period. Dropped that monster right in the middle of the road with your wife and son by your side… what a perfect hunt. Thanks for the story. 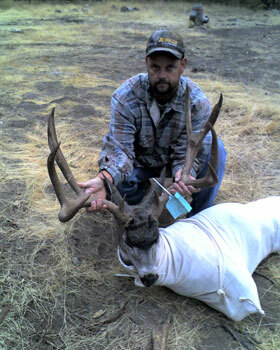 Hank nice nice buck im from Oregon big buck country But All my relatives are from the Ione area Robles, Hortado maybe you know some. Thats nice buck. Good luck hunting next year. Actually my wife knows the hortados. :). I personally do not. Thank you for your comments and looking at the pics. First of all i want to set one thing straight, i took that buck in public forest, I DID NOT shoot from or on the road. It really upsets me that the author would even right that in the story. Totally not true. Yes my wife and son were with me. He wrote quite a few things that were not true. I shot that buck on a deer trail, we were sitting just off the deer trail we were watching. I was in the right place at the right time, just like if any other hunter was there. Thank you for looking at the pics and comments.